Enjoy peace of mind with field-proven ninth-generation technology for reliable access to unstructured data - in the same 3.5-inch footprint! Supporting the industryâ€™s best response times for an 8 TB nearline drive, Seagateâ€™s Enterprise Capacity 3.5 HDD enables the fastest data transfers thanks to our comprehensive advanced caching technology. Meet your storage workload requirements in the most efficient and cost-effective data centre footprint available on the market today. With user-definable innovative technology advancements like PowerBalanceâ„¢, PowerChoiceâ„¢ and RAID Rebuildâ„¢, you have the control to tailor your bulk storage requirements for even greater improvements in lowering your total cost of ownership. When building maximum density server and storage solutions with Seagateâ€™s 8 TB Enterprise Capacity 3.5 HDD, you can rest easy knowing that your storage infrastructure can scale to meet your growing capacity needs while offering your users a consistent and predictable response rate. Built to support enterprise-class nearline workloads of 550 TB per year and backed by a 2M hour MTBF and 5-year limited warranty, the Enterprise Capacity 3.5 HDD ensures you can meet all of your bulk storage SLAs. High capacity storage for multi-drive chassis requires predictable and reliable performance. The Enterprise Capacity 3.5 HDD is built to support enterprise-class nearline workloads of up 550 TB per year, which is up to 10Ã— the rated workload of desktop HDDs. Clearly, the Enterprise Capacity 3.5 HDD can help to ensure that you meet your rigorous bulk storage SLAs. Choose from 12 Gb/s SAS or SATA 6 Gb/s interfaces for easy integration into existing platforms. 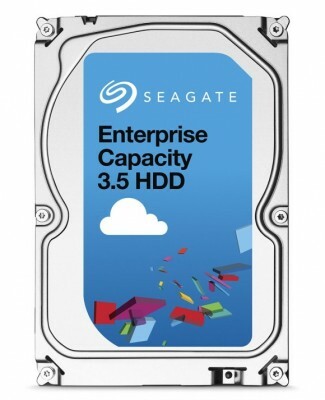 Enterprise Capacity 3.5 HDD protects data where it lives - on the drive. Choose from government-grade SED FIPS 140-2 option1 or SED models with Seagate Instant Secure Erase2 technology for easy and cost effective drive disposal. Seagate was again selected by IT professionals as the 2016 Market Leader for Enterprise HDDs. Get the full report to see the survey data behind the voting for Market, Performance, Reliability, Price, Service & Support and Innovation Leaders.